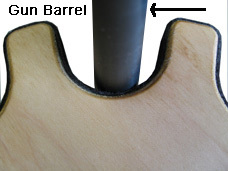 Our Magnetic Rotary Gun Racks have High Powered Magnets embedded behind the protective Felt Material in the Barrel Rests. Below is a Video Review of our Magnetic Rotary Gun Rack. NOTE: The review will start after he mentions the rifle. NOTE: Gun barrels must make contact with the back of the barrel rest.